That’s nyoice, that’s different, that’s unewesyewl! Last week’s theme was about quirky features in your home. The one above is a quirky feature in ours (rental). 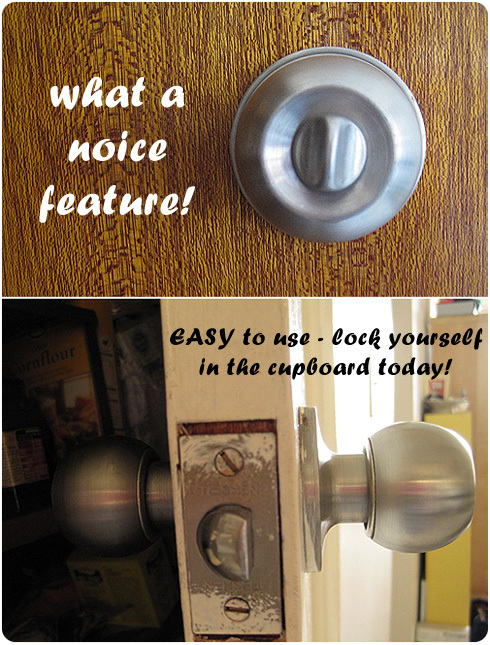 The pantry cupboard has a door knob on the inside as well as the outside. And it has a lock. That’s right, you can lock yourself in the pantry cupboard. Maybe the person who installed the extra door knob wanted to sit in the shelves and pretend to be a packet of flour. Or perhaps they had a secret identity and liked to hang upside down in dark places like a fruit bat. Whatever the reason they would have to been very tiny as there is not much room for a person in there. The mind boggles. To play along, visit the lovely Pip! If my memory serves me the linen cupboard also has this “feature”? Hey, hey! It’s my Husbitect! Yeah, it has an odd lock thing too. Seems to be used for the times when you accidently lock yourself in the linen cupboard! Someone obviously had a food sharing issue when (if) that was ever a flat share! Maybe some not so handy handy man put the handles on the wrong way round??? Or bought a cheap box of handles that wouldn’t go on any other way. That’s the logical answer. Maybe it is to give the mice some privacy? Oh that would come in very handy in a game of hide and seek wouldn’t it!